A Tale of Two Solitudes: Comparing Conflict and Development-induced Internal Displacement and Involuntary Resettlement - By R. Muggah. International Migration, vol. 41, no. 5 (2003):5-31. Addressing Internal Displacement - A Framework For National Responsibility (April 2005). African Union Convention for the Prevention of Internal Displacement and the Protection of and Assistance to Internally Displaced Persons in Africa - NGO Commentary. Paris: FIDH, 2008. All Reports from the Representative of the Secretary-General on the Human Rights of Internally Displaced Persons - Refworld. Article and Paper Index - Brookings-Bern Project on Internal Displacement. Provides country and thematic access to in-house publications. Centre on Housing Rights and Evictions (COHRE): Forced Evictions - For forced evictions to ever be considered as lawful, they may only occur in very 'exceptional circumstances' and only if there are no feasible alternatives. Even then, certain requirements must still be adhered to. Concept of Internal Displacement and the Case for Internally Displaced Persons as a Category of Concern - By E. Mooney. Refugee Survey Quarterly, vol. 24, no. 3 (2005): 9-26. Dilemmas of Development-Induced Displacement- Forced Migration Review, no. 12 (January 2002). Development-induced and Conflict-induced IDPs: Bridging the Research Divide - By M.M. Cernea. Forced Migration Review, Special Issue (December 2006): 25-27. FMO Research Guide: Development-induced Displacement and Resettlement - By J. Stanley. Oxford: Forced Migration Online, January 2004. FMO Research Guide: Internal Displacement - By Cathrine Brun. Oxford: Forced Migration Online, October 2005. The aim of this research guide is to give an introduction to some of the main debates regarding internal displacement. 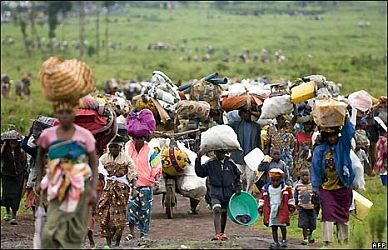 Although the guide concentrates on conflict induced internal displacement, causes of internal displacement are extremely complex and the displacement of populations due to environmental change, natural disasters, and development projects is often interlinked with and simultaneous to conflicts causing the forced movement of people. For Disaster IDPs: An Institutional Gap - By R. Cohen. Washington, DC: Brookings-Bern Project on Internal Displacement, 2008. Forced Migration Review - A magazine published three times a year in English, Arabic, Spanish and French by the Refugee Studies Centre of the Oxford Department of International Development, University of Oxford. Presents concise, accessible articles by policymakers, practitioners, researchers and displaced people in order to share information, experience and recommendations on issues affecting refugees, internally displaced people and stateless people. Global Database on the Guiding Principles on Internal Displacement - Washington, DC: Brookings-Bern Project on Internal Displacement & Institute for the Study of International Migration. In addition to legal texts and instruments, provides access to books and articles on IDPs. GP10: Resources - Here you can find a selection of the most important documents and web resources pertaining to the rights of internally displaced people. Guiding Principles on Internal Displacement as International Minimum Standard and Protection Tool - By Walter Kaelin. Refugee Survey Quarterly, vol. 24, no. 3 (2005): 27-36. Guiding Principles on Internal Displacement: An Innovation in International Standard Setting - From Global Governance, vol. 10 (2004): 459-80. Guiding Principles on Internal Displacement: Annotations - By Walter Kaelin. 2nd ed. Studies in Transnational Legal Policy, no. 38. Washington, DC: American Society of International Law & Brookings-Bern Project on Internal Displacement, 2008. Handbook for Applying the Guiding Principles on Internal Displacement - By Susan Forbes Martin. Washington, DC: Brookings Institution Project on Internal Displacement & OCHA, 1999. Internal Displacement - Brookings Institution commentary and research. Internal Displacement Monitoring Centre (IDMC) - In addition to its country-specific reports (Internal Displacement Updates and Special Country Reports), the IDMC publishes a yearly Global Overview of trends and developments with regard to internal displacement, as well as regional and thematic reports. Internally Displaced Persons -Provides access to legal, policy and background information documents in Refworld. International Human Rights Law - Geneva: OHCHR. International Humanitarian Law Database - Geneva: ICRC. Mandate - Brookings-Bern Project on Internal Displacement. National and Regional Laws and Policies on Internal Displacement: Index - Washington, DC: Brookings-Bern Project on Internal Displacement. National Legislation Relating to IDPs - Refworld. Geneva: UNHCR. Process and Prospects for the U.N. Guiding Principles on Internal Displacement to Become Customary International Law - "A Preliminary Assessment.Georgetown Journal of International Law, vol. 35, no. 3 (Spring 2004). Protecting Internally Displaced Persons - A Manual for Law and Policymakers (Oct. 2008). Risks and Rights: The Causes, Consequences, and Challenges of Development-Induced Displacement - By W.C. Robinson. Washington, DC: Brookings Institution-SAIS Project on Internal Displacement, 2003. Summary Report of the Conference on Development-induced Displacement - Washington, DC: Brookings-SAIS Project on Internal Displacement, December 2002. Translated Versions of the Guiding Principles on Internal Displacement - Washington, DC: Brookings-Bern Project on Internal Displacement. Treaty Collection - New York: UN. UNHCR: Internally Displaced People - Provides information on UNHCR's role in protecting and assisting IDPs, access to policy documents, and other resources. This webpage last updated on Wednesday, January 6, 2016 3:52 PM.